So what’s on this summer of 2014? Apparently, the“bob” has come back with a vengeance. Not that it went of style really. Ever since its resurgence in the 60’s, the bob has been one of the most popular hairstyles around the world. Because of its versatility, this undying do can actually virtually look good with any color, face-shape, texture and age. It has always been a much loved hairdo and famous personalities occasionally come popping out in this style. But this year, let’s see what a little keratin treatment can do to twist and turn this old-time favorite into something new and fresh. True to its name, the classy bob still remains just that- a classic. This short, elegant and low maintenance style is simply immortal. Despite the different haircuts to have come up in the past decades, this style can be frequently in magazines, runways, and movies. With a keratin treatment, a classy bob can be easily made outstanding as highlights become more visible, hair maintains its volume and frizz, which is actually a main problem with bobs, can be totally eliminated. If you prefer bangs with your classy bob, a keratin treatment can help keep them in place with minimal effort. The long bob has gained much attention this year as well. This style is the perfect combination of elegance, practicality and poise. Most often it is worn as a neat, wavy hairstyle perfect for the busy yet sophisticated working woman who can’t spend too much time in front of the mirror. However the straight tresses with bangs look is also quickly getting its own spotlight. The dramatic and mysterious effect it gives is gaining popularity, especially among teenagers. For those who like the flattering lines of long hair, but can’t stand the hassle of everyday styling this is an ideal haircut. With a keratin treatment, this favorite can be effortlessly maintained for up to four months. Plus, it can provide natural-looking, clean lines instead of the stick-like straightness other treatments give. Aside from the lovable, sleek long bobs, we’ve also got, the more carefree messy bob. It’s short and curly perfect for the bohemian chic that’s never afraid to reveal her inner wild side. What’s great about the messy bob is that it goes great with just about any outfit and hair color. But it certainly is more flattering on those with dark tresses. However, sporting a messy bob can be quite tricky. There’s really a thin line between stylishly messy and just plain “messy” messy. 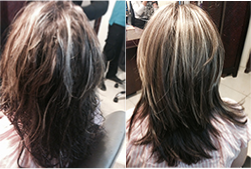 Fortunately keratin treatment has helped many women sport this do with ease and sophistication. With the proper treatment those wild manes can be easily tamed into lively, elegant curls that fall naturally. Plus, it adds effect keeping hair looking naturally moist instead of dry and dreary. Still wondering which bob to get this summer? Don’t fret. We’re pretty sure it will look great on you. Whatever catches your fancy, don’t forget to get a keratin treatment to enhance the full beauty for your summer bob.